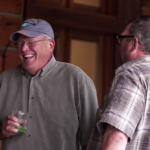 Montana Adventures at the Silver Bow Club on the Big Hole River. 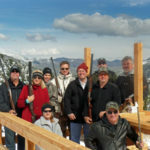 With 1800 acres to explore at the Silver Bow Club and more than 147,000 square miles in Montana, there is always something to do! Schedule an Aerial Photo Flight in the private helicopter at the Silver Bow Club with your host and get a bird’s eye view of Southwest Montana. Our skilled pilots show you Montana from above for a unique photo capturing adventure. Tour the ranch on an ATV! 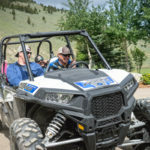 Explore the hay meadows and the mountains of the Silver Bow Club on a guided ATV Tour. Our tours take you high on the mountains behind the ranch to wildflower meadows and breathtaking vistas. Mountaintop lunch included. Just a short distance from the lodge you’ll find the Pioneer Scenic Byway. Travel the length of the Pioneer Mountain Range on the Pioneer Mountain Scenic Byway. You’ll see mountain meadows, lodgepole pine forests and broad willow bottoms. The road gently ascends a 7,800-foot divide between Wise River, flowing north, and Grasshopper Creek, flowing south. Spend the day at America’s first national park, Yellowstone. Yellowstone National Park is the country’s premier wildlife and geyser-watching destination. Travel up the Big Hole River valley and visit the Big Hole Battlefield National Monument. Gain perspective on local history, as well as other Native American sites in the region. History is alive in Montana! Visit Virginia City and Nevada City just outside of nearby Sheridan, Montana. Once-booming gold mining towns, both are operating towns that are restored with old-time shops and cultural events. Bannack, once Montana’s first capital, is an incredibly preserved true ‘ghost’ town. A Montana State Park, Bannack is a short drive from the lodge. Also, visit Coolidge Ghost Town located on the Pioneer Scenic Byway. Due to Montana’s rustic reputation, you might be surprised to find a Jack Nicklaus Signature golf course less than one hour from the ranch. The Old Works Golf Course has quickly gained a reputation as one of the top in the region, and there are also four more public courses within short driving distance. Winter snows are some of the lightest and driest in the country. You can put yourself right in the middle of it at Discovery Basin Ski Resort, just an hour and fifteen minutes down the road from the ranch. For more intense skiing, go over to Big Sky Resort (boasting the most vertical feet in the country) or the nearby Maverick Mountain Ski Area in Polaris. The back-country skiing is breathtaking, and cross-country skiing, snowshoeing, and snowmobiling can all be enjoyed near the ranch as well. Going to ‘town’ from the ranch means Dillon, since it’s the biggest town around. The population is 4,000, and although it’s still a classic cowboy community, there are surprising cultural elements, too. Four art galleries, a local concert series, and influences from The University of Montana Western exist side by side with quaint cafes, tack shops and one of the biggest annual rodeos in the state. Movie theater, fly shops and a large hospital add to the appeal of the town. Twin Bridges is much smaller, but is home to the world-renown Winston Fly Rod Company and a handful of interesting shops and services. Butte is the ‘big city’, with a population of 33,000. It’s known for some fabulous early 1900′s architecture, including the restored Mother Lode Theatre which hosts the Butte Symphony and other concert events. There are art galleries, museums, and a very popular St. Patrick’s Day Festival thanks to the town’s strong Irish ancestry. 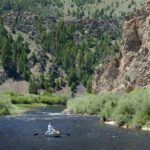 Visit the Silver Bow Club on the Big Hole River in Montana and explore southwest Montana. Fish for Cutthroat, Rainbow and Brown Trout along with Arctic Grayling in the Big Hole River. Walk across the hay meadows or drive a golf cart on the path to the river’s edge. 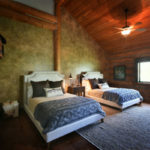 Our guests enjoy unlimited access to the Big Hole River along with our stocked, trout pond. You’ll find your favorite spot to fish along our 3.5 miles of river frontage! 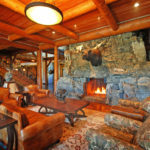 Relax after a day exploring Montana with a massage in your private luxury suite or lodge room. Our therapist offers a variety of popular services along with Aromatherapy, Reiki, Reflexology, and Chakra/Polarity. Schedule with 48 hours advance notice or reserve online. Jump in one of the ranch’s golf carts explore the ranch and beyond. Our one mile golf cart path leaves from the lodge and travels along the river. Passing under an active eagle’s nest, the path takes you to two separate picnic areas along the Big Hole River. Circle back by the cabins and complete the loop. 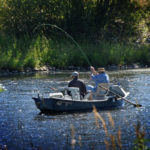 Use carts for carrying fishing gear to some of the best spots to fish on the ranch! For our lodge guests, a cart is included in the nightly fee. Carts are available for our cabin guests for a nominal fee. Hike the craggy slopes of the Pioneer Mountains and take in the spectacular views of the Big Hole River and the valley below. The lodge is your base camp! Our new, one mile, golf cart path is perfect for a stroll or an easy jog. 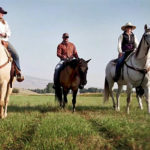 The ranch’s 1800 acres are yours to explore!